Note: There were two distinct communities in Fayette County called Oldenburg. The second Oldenburg was located near High Hill and is now considered a vanished community. The land in this area was included in a Mexican land grant awarded to Nathaniel Townsend in 1838. Portions of the grant were sold to a succession of different people over the years, and in 1885 August Heintze and Gus Steenken, both natives of Oldenburg, Germany, founded a community and named it after their hometown. The majority of the settlers in this area were immigrants from Germany and Bohemia. At its height Oldenburg boasted homes, farms, and a number of businesses and institutions, including stores, saloons, a cotton gin, tin shop, doctors' office, blacksmith shop, post office, church, dance halls (festplatz), and schools. 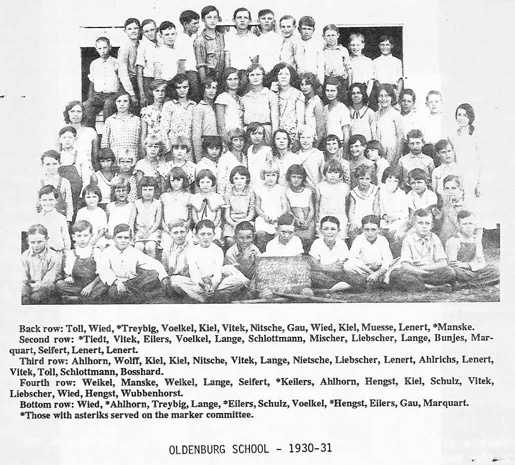 The first school in the community was known as the German and Bohemian Oldenburg School. Founded in 1898, it was succeeded in 1922 by Oldenburg Common School District No.5. A separate school for black students opened about 1930. By 1944, both schools were consolidated with the Fayetteville School District. Descendants of early German and Bohemian settlers continue to reside in this vicinity. the Oldenburg area to Henkel Square at Round Top. 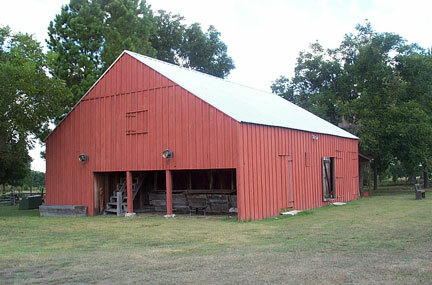 Oldenburg is the name of a settlement about ten miles northeast of La Grange on the La Grange-Round Top road on the banks of Clear Creek. The surrounding country is rich black land prairie. The town consists of two stores, a saloon, a physician's office, a blacksmith shop, a tin shop and a gin. Louis Vodkel [Voelkel] is the leading merchant of the whole neighborhood, who has been in business at Oldenburg for sixteen years, and Muesse Bros. are the popular young saloon men of the town. They own a fine hall in a beautiful grove of liveoaks. The entertainments given in the park are very popular. Oldenburg is a postoffice, but not a voting precinct of the county; the people do their voting at Rutersville and Warrenton. It was founded in 1886 by Gus. Steenken, in company with A. Heintze, and named Oldenburg because a great many people of the neighborhood had come from that country, their native home, and settled here. The population is German and Bohemian. Among the old settlers may be named Gerh. Behrens, F. Oppermann, John Imken, Aug. Gar, Hy. Alhorn, Albert Meinardus, J. B. Meinardus. In the year 1886, the little town of Oldenburg came to be a part of Fayette county, as a town, and lots were sold to prospectivie citizens, among whom was George Speckels, F. Koepke and others. Gus. Steenken had [illegible] a gin and dedicated it that day, and that gin was located on the banks of the creek, and is now operated by Otto Marburger. On the day the town lots were sold, Messrs Aug. Heintze, Reinhard Aschen, Prof. W. H. Saunders (teacher at Warrenton) and others spoke, and from La Grange John Schuhmacher and J. F. McClatchy, the latter a lumber dealer, were in attendance and furnished the beer for the celebration. It was a big day, and Oldnburg [sic. ], nine miles east from La Grange, is still a lively burg. The nature of the celebration, which will probably be held in the Summer, has not yet been decided upon, [illegible] will be a "golden jubilee [illegible] kind, that can be depended upon. R. W. Voelkel, and others of Oldenburg will have charge of the arrangements and before the fiftieth anniversary day will dawn, the whole neighborhood will know about it. There will be public speaking and probably a barbecue. Those who were responsible for the establishing of the town of Oldenburg have long since crossed the Great Divide. August Heintze, (for many years a citizen of LaGrange) and who was eaged in business at Warrenton at the time, opened a store in partnership with Reinhard Aschen, which was continued for several years. Gus. Steenken lived to a good age, so did Koepke and the others. John Speckels, Sr., father of Mrs. Johanna Heintze and Mrs. Louis Walter, was among the speakers for the day when the town was started. The anniversary—the 50th—occurring in this year, when all Texas will celbrate the 100th anniversary of the great achievement of General Sam Houston and his faithful followers—will "fit in" well with the other celebrations and will give to Fayette county, another wreath. The Journal hopes to have more to say about this, later. See more about Oldenburg at TexasEscapes.com.